A packed house listened to Nick Anderson’s presentation ‘How to train in a busy world’ at the Harlington centre on Friday 9th February. Nick is one of the UK’s leading coaches for distance runners and we have already been fortunate to benefit from his expertise with three practical training sessions over the past few months. 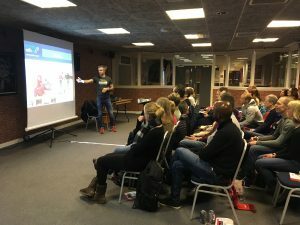 This presentation allowed Nick to discuss the principles of how to train effectively for distance running, focusing on three fundamentals of balancing training with nutrition and rest. With many questions from the floor, the interactive session was an excellent forum for HRR members to appreciate and understand the requirements of training to improve, particularly for longer distances. We will be seeing more of Nick in the future as he will continue to support our coaching team as a next stage, so that we can all put great principles into practice. Nick’s presentation can be downloaded through Facebook and should not be distributed outside of the HRR membership. If you would like to discuss any aspect of the presentation, please speak to Kevin Munt or other members of the coaching team.